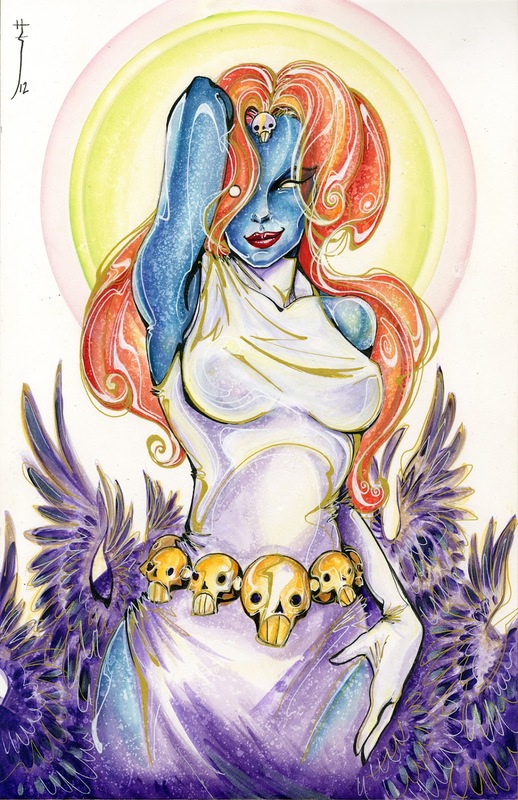 Sara Richard's Blog: Heroes Con! Here is my submission to the Heroes Con charity auction this weekend :) Hopefully it makes the wall this year. 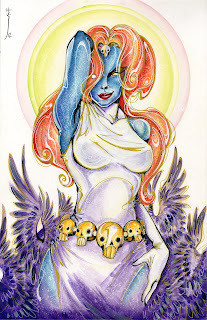 But there is not enough love for Mystique out there so here we are. It had iridescent paints in it which never scan, but it'll make the original more neato. Kinda wish i made her head a bit bigger....buuuut I was working on this at 2am last night. Waa I know. Haha! I'll be doing sketches, selling prints and like Wendy's giving out free smiles....unless you spill Coke on my table.....then death will be dealt swiftly. :D perhaps with a free smile included....OF RAGE! Anyway, see you guys this weekend! I ADORE this pic! I was at herocon and purchased four of your prints. Will this be a print soon for purchase ? I'd love to own a copy! !